Chinese flashcard apps are the bomb. Download them to your smartphone, tablet or computer and you’re good to go! Turns out, it’s not enough to just download some Chinese language learning apps. You’ve got to figure out how to use your apps effectively. Your Chinese language learning will only become more effective once you’ve created a set strategy to augment your study routine with your Chinese flashcard apps. But that means you need to have an action plan. 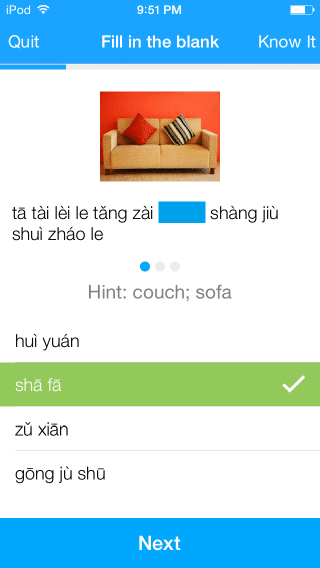 So, you’ve already seen our top recommended apps for learning Chinese. Where can you go to download them? You can download Chinese language flashcard apps to nearly any digitally enabled platform such as your smartphone, tablet, laptop or desktop. There are numerous options to choose from for iPad, iPhone and Android devices. As a matter of fact, if you have a smartwatch that is app-enabled, you can download your language app into your smartwatch as well. Gone are the days when learning a language meant having to hire a tutor or go home and study the pages of a dictionary while sitting at your desk. Today, everything is on the go, smart, connected and convenient. This includes your language learning software. You can keep all the tools and resources you need right in your pocket! Thanks to the ubiquity of smartphones and other small portable digital devices, you can keep your Chinese language classes with you wherever you go. What better way is there to learn a language than to do it while waiting in line at the bank, while commuting on the train, while waiting for a friend in the coffee shop or at any other free moment that in the past would go to waste? There’s even a term for filling dead moments with activities to help you reach goals (like Mandarin Chinese mastery): NET time, or no extra time. Always having a language learning flashcard app handy on a smart device in your pocket will make it convenient to keep up your study habit and practice NET time. No more excuses, you can now study anywhere at any moment. Well, if you have a five minute break, this is more than enough time to review a few flashcards. Using your Chinese language app whenever you have 5 minutes, you’ll be able to optimize your time and take advantage to acquire Chinese in chunks of practice throughout your day. As a matter of fact, some reports reveal that anything learned in chunks and reviewed frequently will stick in your brain better. That’s because it’s a more effective way to learn than the traditional method: prolonged hours of study. No matter what else is going on, and no matter how many times you do use your app to learn the Chinese language, the fact is that it’s always a good idea to still set down a specific amount of time–as well as a specific start time–for flipping through flashcards. This way, your mind becomes prepared at that particular time every day. It’ll be ready to go, knowing that you have a set time to flip through some cards. For example, if you find that you learn new things best first thing in the morning, you can set thirty minutes to an hour for focused practice to look through the cards. As you go along, try and copy the style of writing on a separate notebook page. The Chinese language consists of thousands of unique characters that fluent native speakers must know how to write down. In light of this, it’s always a good idea to keep a paper and pen for the purpose of writing down the characters near you. No matter how convenient it is to try and take your app with you on the go, uploaded on your gadget of choice, you might be surprised by how much better you absorb the nuances of the characters when you have a pen and paper by your side to practice writing them down. Moreover, it’s said that writing by hand engages more of your brain, causing more neural connections to form with the lovely result of improved vocabulary recall. For good habits to form, and for better self-discipline practices to really take root, regularly getting a daily reminder that it’s time for you to study the Chinese language will give you an advantage–you’ll never forget about your language mastery goals. You’ll never miss a day of practice! Even during hectic days when you have many other obligations, you’ll never lose the opportunity to study–even just a little–because you’ll have automated alerts to remind you to take a few moments and make some progress on your language skills. You can download a daily reminder mobile app, such as Wunderlist, to regularly give you alerts. In the same way, you can use the app to remind you about other tasks you need to do during the day, aside from the time you need to set aside to learn the Chinese language. To build a strong habit and ensure that you keep a steady routine that will hardwire your mind with language skills, there’s no better tool than a daily recurring reminder. A regular alert each day as a reminder may be the difference between haphazardly learning something new and actually performing the discipline it takes to do so. When is the best time to learn something new? Some may believe that it’s when your mind is fresh and alert first thing in the morning. Others who feel they’re more alert at night will argue that it’s during evening that the mind is ready to learn. The fact is that everyone’s different. Knowing whether you’re more receptive to learning first thing in the morning or whether you love learning something new at night varies with each individual. Some of us perform best when everyone has settled down and the house is quiet. Other prefer a loud environment with lots of activity. Find out what works for you. Is it morning or evening times? You might even want to give each time a trial run. Try waking up earlier than the rest of the family and see if you learn best then. If you don’t, then try doing the same thing at night. Only you will know what’s best for you when it comes to learning the language of China. 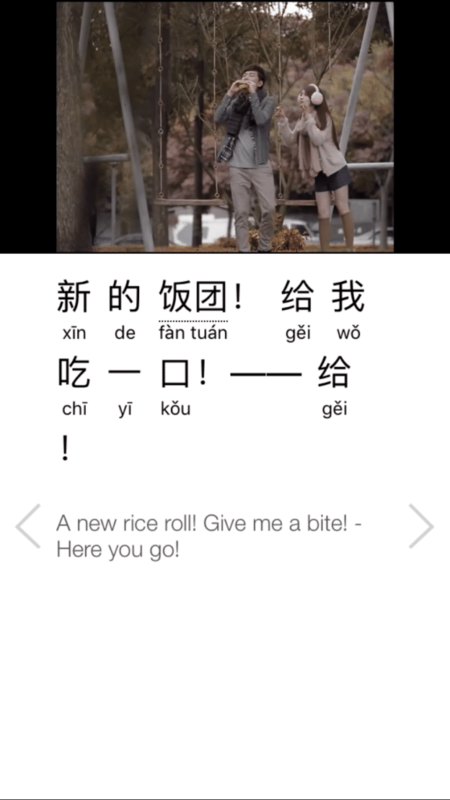 How Do You Stay Motivated to Learn Chinese on the Go? It can’t be denied that adapting to new habits like learning Chinese on the go–and practicing NET time–can be a challenge. Staying motivated as you learn Chinese on the go isn’t that different from staying motivated in any other endeavor. For one thing, think of the reasons why you’ve been trying to learn Chinese in the first place. Is it due to being transferred to China for work? Are you planning to study in a Chinese University and it’s imperative that you learn the language? Do you plan to do business with Chinese traders? Your partner speaks Chinese and it’s a way to connect and better know each other? No matter what reason you initially had for needing to learn the Chinese language, keep in mind that after learning the basics, the learning process does become easier with time. When you learn the Chinese language through an app, you can continue to reinforce your learning by watching Chinese commercials with subtitles, conversing with people from China and even reading Chinese periodicals. 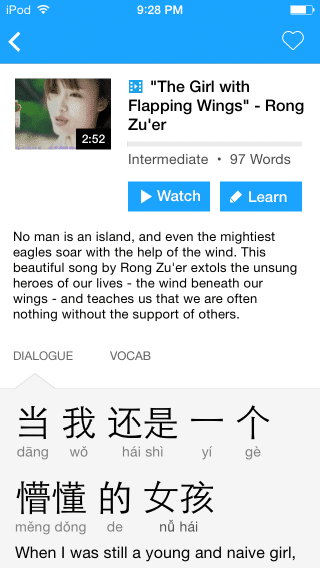 You could even try out the Chinese language video clips over at FluentU. We’ll even help you practice with personalized vocabulary lists and flashcard sets built from the videos themselves! Having achieved learning the basics should motivate you to keep going with confidence. Optimizing your time on the go with Chinese flashcards apps can be the difference between actually studying and reaching fluency and waiting for the ideal time or environment that never seems to come.